Successfully Added Galaxia - Quadband Touchscreen Dual-SIM TV Projector Phone to your Shopping Cart. Our thinnest multimedia projector phone to date! Tired of projector phones that feel like a brick in your pocket? Then you’ll be glad to discover our latest handheld powerhouse, the Galaxia. Measuring in at a mere 14.5mm thick, it’s 25% slimmer than most projector phones on the market - while being much brighter! However, image projection is only the beginning of what this incredible little phone has to offer. Dual SIM- This is great for business people who want to merge their personal and business numbers into one phone. You can even disable one or both of the numbers if you are not available at the moment. TV Tuner + FM Radio- Watch all of your favorite analog TV shows using the SECAM, NTSC and PAL broadcast standards- right from your cell phone! With the built-in antenna it is easy to receive analog television broadcast and stay entertained all day long! The built in antenna can also receive FM radio signals as well. Media Player + Projector– Access and play all of your favorite music, movies, pictures, eBooks, and watch TV shows right from your cellphone. And since this phone uses a powerful projection lamp you can enjoy all of it on a bright and colorful 8 to 30 inch screen! Sure, the Galaxia delivers an impressive array of features, but it’s the simple everyday use of these features that really makes the Galaxia so wonderful to use. This starts with a responsive 3 inch touchscreen, loud built in speakers, clear and easy to navigate menu system, and excellent in hand design with conveniently placed hard buttons. There is even a hard button on the side of this cool gadget that allows you instantly access the built-in projector on a moments notice! 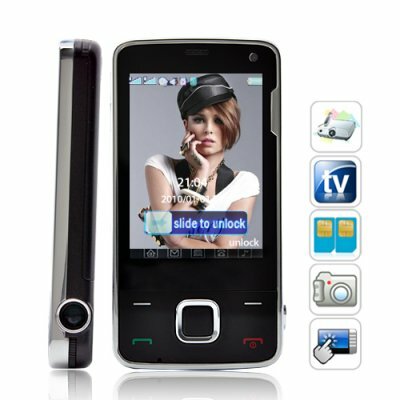 Powerful built in projector, dual-SIM card slots, extensive multimedia features, stylish looks and responsive 3 inch touchscreen. The Galaxia really has it all, and at a price that can not be beat. Order now while this hot new product it still available and we’ll ship out your order 24 hours and even include our famous 12 month guarantee. The Galaxia is available only from the leaders in wholesale electronics, Chinavasion! Fully unlocked phone! Use with any GSM carrier. Loaded with multimedia features and comes with 2 GB TF/ micro SD card. No. This phone is contract-free and fully unlocked so it can work with any GSM service provider you choose. Is this phone like the iPhone? No, this phone is better than the iPhone! Unlike the iPhone, the Galaxia Phone comes fully unlocked and ready for use with any network or carrier straight out of the box. You do not need to use any firmware hacks and risk "bricking" the phone. The Galaxia Phone also has dual SIM, Micro SD slot, video recording functionality and a and more (unlike the iPhone).